1747~1760s: born in Edo in a family of Nô actor. His first name was Takesaburô. Disciple of a man named Horie Kanjirô (unknown business; most likely not related to Nô or Kabuki), he received the name of Horie Kansuke. 1760s: he became disiciple of the sakusha Kanai Sanshô. 11th lunar month of 1764: , Shinshichi worked at the Nakamuraza on the kaomise drama "Azuma no Hana Sôma no Dairi". 11th lunar month of 1766: Shinshichi worked at the Nakamuraza, along with Kadota Sorobê, Dontsû Yosabê I, Nakamura Jûsuke II, Masuyama Kinpachi I and Sei Hidesuke, on the kaomise drama "Kogane no Hana Kaijin Arasmusha", which celebrated the arrival in Edo of the Kamigata actor Kirishima Gizaemon I. 11th lunar month of 1767: Shinshichi worked at the Nakamuraza, along with Kadota Sorobê, Dontsû Yosabê I, Sei Hidesuke and Tsuuchi Denjûrô II, on the kaomise drama "Taiheiki Shizu no Furisode". 11th lunar month of 1769: Shinshichi became nimaime sakusha and worked at the Nakamuraza for the tatesakusha Sakurada Jisuke I on the kaomise drama "Kawaranu Hanasakae Hachinoki". 11th lunar month of 1770: Shinshichi worked at the Nakamuraza for the tatesakusha Sakurada Jisuke I on the kaomise drama "Nue no Mori Ichiyô no Mato", which celebrated the shûmei of Matsumoto Kôshirô II, Ichikawa Danjûrô V, Nakamura Shôchô, Ichikawa Monnosuke II, Nakamura Shichisaburô III and Bandô Sanpachi II. 11th lunar month of 1771: Shinshichi worked at the Nakamuraza for the tatesakusha Nakamura Jûsuke II on the kaomise drama "Kuni no Hana Ono no Itsumoji". 11th lunar month of 1773: premiere at the Nakamuraza of the kaomise drama "Gohiiki Kanjinchô". Shinshichi and Okuno Sasuke worked on this drama under the supervision of the tatesakusha Sakurada Jisuke I This 46-days long performance, which also celebrated the shûmei of Nakamura Rikô I, was a tremendous success. 11th lunar month of 1774: Shinshichi worked at the Nakamuraza for the tatesakusha Sakurada Jisuke I on the kaomise drama "Kaomise Ama no Iwato". 3rd lunar month of 1775: Shinshichi wrote the lyrics in the same theater of the Tokiwazu-based dance-drama "Shinobu Uri", which was successfully staged with Nakamura Nakazô I, Ichikawa Danzô IV, Yamashita Kinsaku II, Ichikawa Monnosuke II and Arashi Hinaji. 11th lunar month of 1778: Shinshichi became tatesakusha and worked at the Moritaza on the kaomise drama "Date Nishiki Tsui no Yumitori". He wrote the lyrics of the Tokiwazu-based dance-drama "Momiji Gasa Ito no Nishikigi". 11th lunar month of 1779: Shinshichi worked at the Moritaza on the kaomise drama "Uta Kurabe Tôsei Moyô". He wrote the lyrics of the Tokiwazu-based dance-drama "Iro Masete Yuki no Tokizake". 11th lunar month of 1780: Shinshichi worked at the Nakamuraza on the kaomise drama "Kite Kaeru Nishiki no Wakayaka". He wrote the lyrics of the Tokiwazu-based dance-drama "Iro-ni Iro Momiji no Tamazusa". 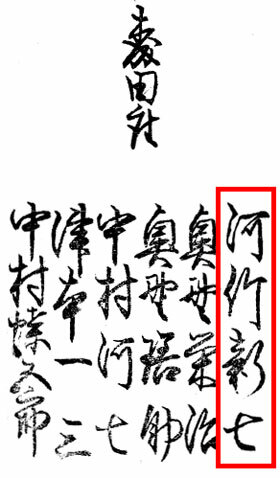 12th lunar month of 1786: Shinshichi went with Nakamura Nakazô I in Kamigata. He provided Ôsaka sakusha like Chikamatsu Tokusô with advices and comments on the art of playwrighting. 1793: he took the tonsure in Edo, calling himself Chikuô. 14th day of the 3rd lunar month of 1795 : he died in Edo. Kawatake Shinshichi I was an important Edo sakusha, who was active from the 1760s to 1780 and worked on more than 30 dramas, including several Tokiwazu-based dance-dramas. He was very close to the actor Nakamura Nakazô I.
 the 14th day of the 3rd lunar month of the 7th year of the Kansei era was the 2nd of May 1795 in the western calendar.